Spring Boot web project with source code for download. This code will display the event calendar using the default config (day view, the default CSS theme). The default CSS classes are embedded and there is no need to include additional CSS style files. You can create a custom CSS theme using the online CSS theme designer and apply it using theme property. You can see that the locale affects the date format in the header (d.M.yyyy vs M/d/yyyy) and also the first day of week (Monday vs Sunday). 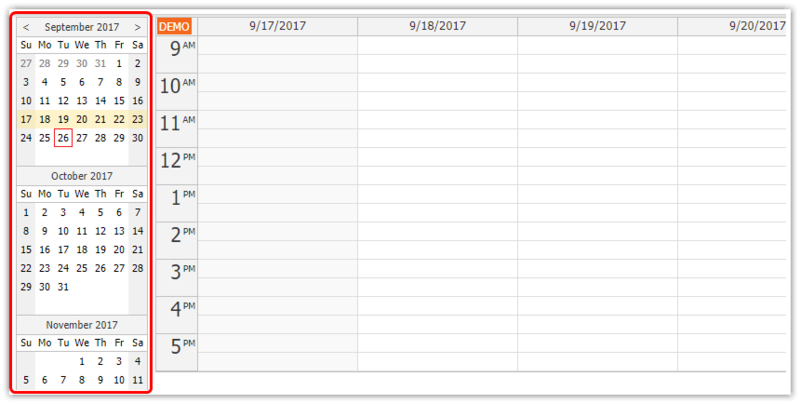 DayPilot Pro includes a date picker control (called DayPilot.Navigator) that lets users choose a date using a mini calendar. The Spring controller is very simple and uses an EventRepository interface (that inherits from CrudRepository<Event, Long>) to load the event data. Tutorial with source code - a web application for scheduling dependent machine/production jobs, implemented in Spring Boot (Java).